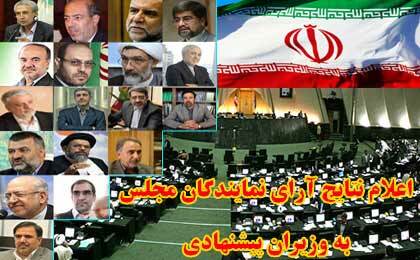 Iranian parliament, the Majlis, approved the cabinet ministers proposed by President Rouhani, with exception of three ministries of Education, Science and Technology, and Sports. Javad Zarif is the new foreign minister, in charge of the new foreign policy of “moderation and realism.” Bijan Zanganeh will lead the oil ministry, the first non-IRGC officer to control the country’s oil industry in many years. Meanwhile, the former foreign minister Ali Akbar Salehi will head the Atomic Energy Organization of Iran (AEOI). No announcement for the position of chief nuclear negotiator has yet been made. the rejection of three nominees is the headline, NU, not the claim that they approved the others. Iranian policy and failing to emphasize that he's already being hobbled. Why haven't you mentioned the fact that the future "minister of justice" Mostafa Pourmohammadi is a known criminal that was reponsible for the execution of thousands of opponents of the terrorist regime? It will be wonderful to see iranians realize that all of Rouhani's bull s was just tarof. That will happen in about one year I estimate. It is shameful and morally unacceptable that not even one single woman was allowed into the cabinet whilst the Mullas, a tiny portion of the total population , occupy nearly 20% of the total cabinet seats. I sometime wonder whether the ruling elites in Iran genuinely love and have aspiration for their wife, sisters and daughters to be rewarded with the opportunity to contest or hold the highest office in the land . Forget about it! As long as this regime is in control of Iran there is no "hope" for real change.Ahmadinejad was the monkey so is Rouhani and the organ grinder is still Khamenei.Same donkey different coloured collar. please, NU, I understand your hope, but you surely can't truly cling to the idea that little Mahmoud has been in control of Iran's foreign policy. you know better than that. The damage he did to Iran's global standing is beyond repair in short run; the worst president in the history of the Islamic Republic. Come on now! You know better than that to claim that this or that person was the "worst president".Don't you know yet that it is the valih-e-faqih that makes all the major decisions?